A cold winter morning not too long ago, a dusting of snow lay on the Greenfields. This was very popular with the children in Brockenborings, who had snowball fights and built snowmen ter pass the waiting time before Yule. They were joined by the sheepdogs in the village, since the sheep had moved inside because of the cold. Two sheepdogs were missing from the fun and games, though. Lying in his favourite spot near the fireplace, Ruff sulked and pondered on the difficulties of life. His time with the lovely lass Aurora had been nothing but grand, and they had been more or less inseparable ever since that unfortunate incident with the tunnels. Still, lately Aurora had been awful moody. Always sleepy, mostly grumpy, with an appetite ter rival even the fattest hobbits in the Four Farthings. And ooh, had the result of that appetite ever started ter show around her belly. Waking up this morning, looking at the snow, she had yawned and said: “I’d like me some scones today”. Ruff, fresh out of scones, brought her some marrow bones instead. Her resulting loud bark of “I want SCOOONES!” still rang in his ears. He could stand up to wolves, shrews and silly brothers, but risk the wrath of a grouchy sheepdog lass? No way. Dejected, he wandered into the kitchen, where his owners were busy preparing food fer the Yuletide. “Come here, Ruff”, said the young lass of the house, “I’m baking Yule bread!”. Ruff jumped up on the table and watched the lass mix ingredients for the dough. Flour, milk, butter, sugar, eggs… Looking at the dough, Ruff started pondering. “And now the dried fruits”, the lass said, reaching for the jar. Ruff shuddered and sneezed at the jar. “What, yer don’t like fruit?”, the lassie said. Nuh-uh, Ruff shook his head, at least not those horrible dried things. They made him sneeze somet horribly. Ruff wagged his tail and licked the lassie on her cheek. Barking happily, Ruff jumped down from the table. Still, scones without clotted cream? Impossible. Aurora wouldn’t stand for it. So Ruff ran outside and bounced through the snowdrifts towards the dairy. Making his way inside, he saw pail upon pail full of fresh milk. As yer know, them cows in Brockenborings produce the sweetest, fattest milk in the Shire. Not a single tub of clotted cream was ter be seen, but Ruff couldn’t help but notice a curious contraption lying huddled in a bundle beneath the window. It looked like a huge udder with a lot of wooden pipes sticking out of it. Ruff picked up the object. He’d never seen one of them things before. I wonder what this does, he thought as he pushed and pressed and shook the thing around. How curious, Ruff thought, as he tried to blow into the wooden pipe. Try as he might, though, nothing happened. “Aw, come on, ‘s not that hard”, the cow said. “Just make an effort and squeeze that bag while yer blow the pipe.” Leaning further through the window to get a good look, the cow tipped a jar that stood in the windowsill. The jar toppled over, and its contents fell out and rained over Ruff. Ruff let out a massive sneeze straight into the wooden pipe. At the same time, he clutched his paws together hard, squeezing the bag in the process. The ensuing howling sound had an almost explosive effect that made the small dairy shook at its foundations. What a horrible noise! The cow ran off mooing, forgetting any complaints about cold farmer hands. All over the village, hobbits dove for cover, while sheepdogs hid under beds. Inside the dairy, the pails of milk started shaking and wobbling. When Ruff woke up five minutes later, the room had that sweet smell of warmed-up cream. Looking into the nearest pail, he saw that the milk had clotted after the horrible incident with the bag of pipes. There’ll have ter be a lot of scones made this Yule, Ruff said as he ran off, bringing one pail with him. Smiling at him, she added: “And yer will make a grand father too”. Butbutbut… father? I am young, I know nothing of parenthood, I’ll surely do everything wrong, I just clotted all the milk in the village! Ruff whined. “Ah, don’t worry”, Aurora said, “I am sure the two of us can manage this together”. She leaned in and sniffed Ruff behind his ear, then licked his cheek. 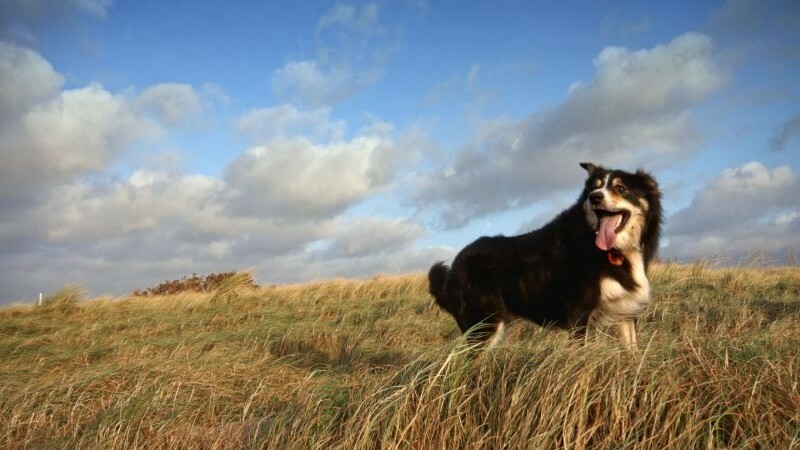 When it comes ter make a lad strong and brave, no power is stronger than the lick from a sweet sheepdog lass. In the days ahead, while the villagers continued ter prepare Yule, Ruff and Aurora planned ter receive their first litter of sheepdog pups. And the tales I can tell yer of that birth, ha, now that’s something. Rumours says a lot of clotted cream was involved somehow. But that story will have ter wait until another night. For now ends the tale of how Ruff made scones and clotted cream fer his sweetheart Aurora.